Photo from site that has gone. This member of the Aizoaceae family was given this name by Steven A. Hammer in 1995. It is found in Klein Karoo, Southern Africa. 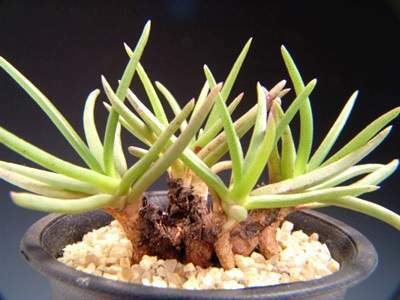 It grows in a grit or other well drained soil with little water and lots of sun. The caudex will grow up to six centimetres in diameter, the plant raises up to twelve centimetres. The flowers are white and pink.